Did you know that it may take just 39 milliseconds to form a first impression of somebody? (Bar, Neta and Linz, 2006) A bad first impression may take some time to change and communication affects every clinical encounter (Roberts et al, 2013)– definitely worth pondering! The issues of language in regards to LBP are known to be problematic and the literature recognises a need for shared use of language to enhance both patient and therapist satisfaction (Cedrashi et al, 1998). An insightful qualitative study explored the use of language by health professionals treating LBP and found distinct areas where there were different uses of language (Barker, Reid and Minns Lowe, 2009). The health care practitioners involved in the study were Chiropractors, GPs, Osteopaths and Physiotherapists. The findings showed terms fell into three categories: 1. Potentially leading to problematic misunderstandings, 2. Having unintended meanings but few negative repercussions, and 3. Meeting the expectation and intention of understanding. This is summarised below in Table 1. Surprisingly, for me, the responses that were felt to have good agreement were on areas that appear to be “therapy” specific. Examples of these terms are ‘mobilisation’, ‘manipulation’ and ‘soft tissue technique’. However, it appears that biomedical terms such as ‘neurological involvement’, ‘arthritis’, ‘instability’ and ‘non-specific LBP’ were problematic. This is in keeping with an excellent metasynthesis of qualitative studies by Bunzli et al (2013) which identified tensions between the clinician and patient when discussing, through the biomedical paradigm, the ligitimisation of pain and suffering, uncertainty, fear and anxiety for the future. The paper highlights key areas that require a shift in thinking across the medical profession in the management of chronic LBP. Of interest, terms such as ‘managing your back pain’, ‘coping’ and ‘activity’ were also seen as problematic in the study by Barker, Reid and Minns Lowe (2009). This strikes me as concerning, as these are key areas for patient education, understanding and engagement for rehabilitation. On twitter I discussed the use of words with Peter Moore (@paintoolkit2), co-author of Pain Toolkit, who felt that more appropriate language could be used, as it would be more helpful. The word “coping” can be interpreted as “making do” whereas “active self-managers” or “active self-learners” are more empowering. The issues surrounding connotations of words are very interesting. How many times in my career have I used words that seem very benign and non-threatening to me, but are potentially frightening and even harmful for the patient? Table 2 captures some perceptions of common terms that we use in clinical practice. Even with the very best of intentions, what we tell our patients may be perceived as something completely different and in some ways extremely harmful. This all makes sense when you consider the mature organism model that was conceptualised by the late, great Louis Gifford (1998). An important aspect of the model is the focus on pain and its relationship to stress biology. By that, I mean that a stress response is aimed at motivating the person to alter their behaviour in order to recover and survive. This, in the short term, is an extremely helpful and desirable quality to have. However, in the long term, the response may facilitate maladaptive and non-helpful behaviours that affect the nervous system, the motor system, the endocrine system and the immune system, to name a few, in an adverse way. 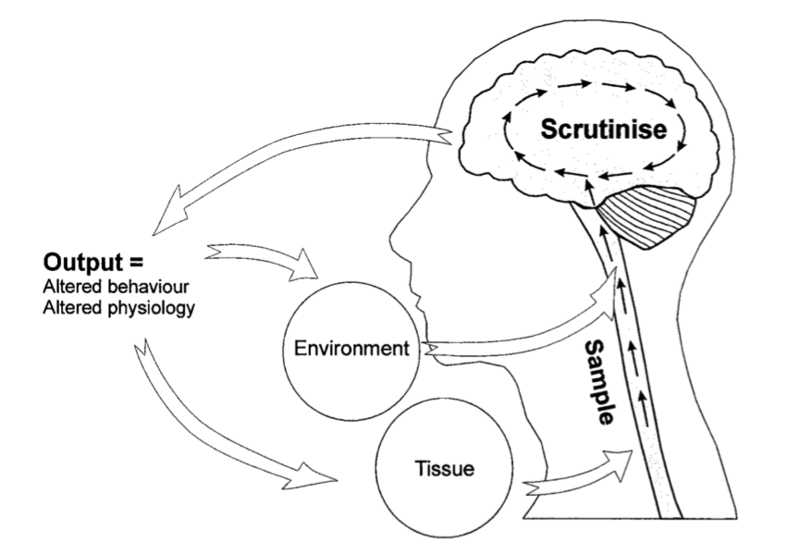 In figure 1, we can see how sensory information is processed within the spinal cord and is scrutinized by the brain. In response, a person will perform a protective action, dependent on their prior experiences, beliefs, thoughts and feelings. The protective action becomes embedded as an associated memory. Then the cycle has the ability to repeat itself. 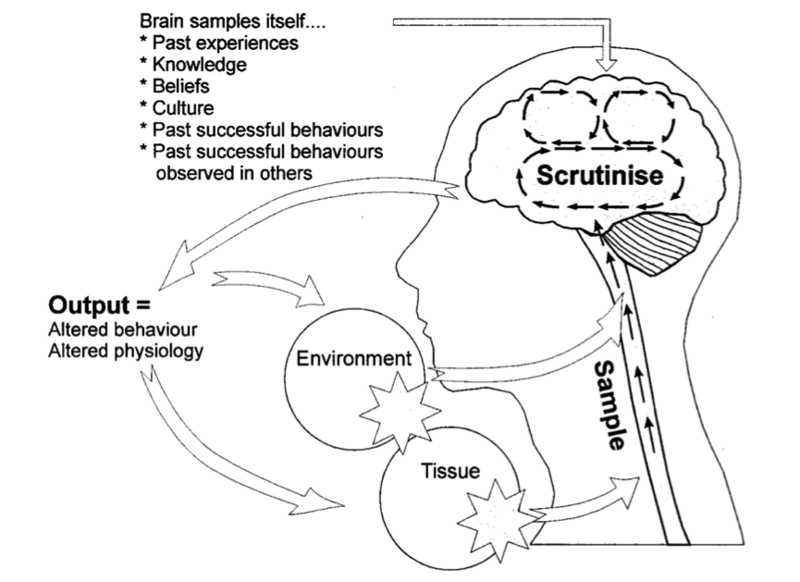 The words therapists use can be the sensory input that can start this cycle again in the mature organism model, resulting in altered behaviour and physiology (see figure 2). Examples of negative altered behaviour could include the effect on the motor system through guarding and breath-holding to protect from pain. An increased sensitivity of the nervous system could occur and result in central sensitisation where a non-noxious stimulus is perceived as painful (allodynia and secondary hyperalgesia). The ongoing stress of pain may increase levels of adrenaline and nor-adrenaline and affect multiple organs via the autonomic nervous system. Levels of cortisol may increase to maintain a sense of homeostasis and the immune system can become impaired and have a negative effect on recovery. This may maintain ongoing sensitivity of the nervous system and so the cycle continues: more threat, more sensitivity, reduced tolerance, poor sleep and recovery, altered physiology, altered behaviour and mood, reduced self-management strategies and ongoing pain. By no means is this blog intended to be comprehensive, particularly on such a large topic as pain. But I hope that it highlights the importance that communication has on our therapeutic encounters. As much as it can hinder, or arguably harm, progress, it has the capacity to be able to change people’s lives for the better. It is of fundamental importance to build relationships with our patients and their values (link to blog on EBP) and to move towards helpful behavioural change. So, as I reflect on language, concepts and evidence-based practice, I realise that being a physiotherapist is such a fulfilling job as it has so many complexities and components to ponder. All of them require ongoing reflection particularly on my ability to communicate. This is the tip of the iceberg ….just the beginning of reflection on communicating with patients! It begs the question, how well do I communicate with other therapists? That may be an entirely different post all together! Barker K, Reid M, Minns Lowe J. (2009) Divided By A Common Language? A Qualitative Study Exploring The use Of Language By Health Professionals Treating Back Pain. BMC Musculoskeletal Disorders 123, (10); 1-10. Bunzli S, Watkins R, Smith A, Schutze, O’Sullivan P. (2013) A Qualitative Synthesis Exploring The Experience Of Chronic Low Back Pain. Clinical Journal Of Pain. 29; (10). 907-916. Cedraschi C, Nordin M, Nachemson A, Vischer T. (1998) Health Care Providers Should Use A Common Language In Relation To Low Back Pain Patients. Ballieres Clinical Rheumatology; 12, (1): 1–15. Gifford L (1998) Pain, The Tissues And The Nervous System: A Conceptual Model. Physiotherapy 84 (1): 27-36. Roberts L, Whittle C, Cleland J, Wald M. (2013) Measuring Verbal Communication in Initial Physical Therapy Encounters. Physical Therapy; 93: 479-491. Thanks Matt I really enjoyed your blog and the clip from Peter O’Sullivan was brilliant. Really refreshing to read your thoughts and thank you for putting such good research together for us to enjoy! Keep writing 🙂 and it was great to meet you on the weekend! and I hope to write another post soon! Hopefully see you soon.